Auburn Hills, Mich. September 1, 2018 The iconic Jeep® Wrangler – the most capable and recognized vehicle in the world – delivers unmatched off-road capability and is produced with more than seven decades of 4×4 engineering experience. Powertrain options include a 3.6-liter Pentastar V-6 and an all-new 2.0-liter turbocharged inline four-cylinder engine. 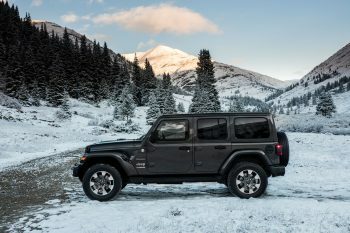 Wrangler continues to offer a body-on-frame design, front and rear five-link suspension system, solid axles, electronic lockers and is one of the few midsize SUVs that offer a six-speed manual transmission in addition to its available eight-speed automatic.